The oft-cited death of print media does not seem to have dampened people’s desire to write books. About 750 new titles are published in the US each day! Two good friends of this blog have recently published books. It’s clear in both instances that their writing was a labor of love, and what they’ve shared may be very helpful to young engineers. Anthony Fasano provides career coaching. 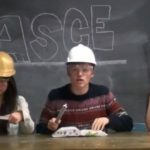 He shared some tips with the ASCE younger members at the 2010 annual conference in Las Vegas. See the blog entry: Younger Member Networking post ASCE2010 . Anthony’s new book, entitled Engineer Your Own Success: 7 Key Elements to Creating an Extraordinary Engineering Career, will be available in May of this year. The book will guide engineers and technical professionals in developing their non-technical skills such as goal setting, obtaining important credentials, finding a mentor, leadership, networking and communication skills, as well as organization and productivity. On the Website for the book you can find a summary video and new chapter excerpts from the book each week. There is also a Facebook page. A portion of each book sale will be donated to Engineers Without Borders (EWB). Reed Brockman has long been a champion of engineering outreach in the Boston area. Over the past few years, I’ve had the chance to work alongside Reed on the Committee for Pre-college outreach. In 2009, Reed organized the service and outreach event at the ASCE Annual Conference in Kansas City. See blog entry: Get Out: Outreach!. He always has new creative ways to communicate with kids about engineering, and he has finally put them all down in his new book: From Sundaes to Space Stations: Careers in Civil Engineering. A launch party and lecture by Reed himself is scheduled for April 21st at the Wellesley Booksmith in Wellesley, MA. Learn more about the event on Facebook. It’s good to see engineering professionals contributing to the profession in this way. The great thing about Anthony’s and Reed’s books is that they’re intended for a very broad audience. So many engineers limit themselves to the highly technical realm of research papers and technical journals. Perhaps if more engineers began writing for public consumption there would be a better appreciation of the profession and improved technical literacy among the general public. What topics could other engineers write about that would interest you? If you had the time (and we know you’ve got the talent), what would you write about? We’d love to hear your suggestions. Please use the comment feature below.